The Finish Line Grunge Brush is an clever designed brush that helps you keeping your chainrings, chain and other drive train parts clean. While I do have a collection of Morgan Blue brushes the Finish Line Grunge Brush is an excellent addition. In this article I will have a look at the clever design and share my practical experiences with the Finish Line Grunge Brush. The Finish Line Grunge Brush is uniquely designed with specific brushes for specific purposes on each side. In the paragraphs below I will have a more detailed look at each of the Finish Line Grunge Brush ends. The Finish Line Grunge Brush has the text “The Grunge Brush” cutout in the hand-grip of the brush, which has a H-shaped form and isn’t particularly ergonomic. However this shape is more or less required to facilitate the hooks for the brushes (short and long hair) that can be replaced on both ends. In the picture above you see the U-shaped set of 3 short-hair brushes of the one end of the Finish Line Grunge Brush. 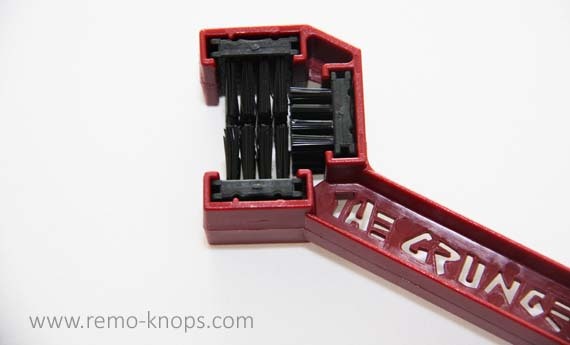 It is the ideal shape to push slide over your chain and give your cranks set a spin to clean. Also I have a Muc-Off X-3 Dirty Chain Machine and Muc-Off Bio Drivetrain Cleaner I’m not using the chain machine each time I clean my bike. The long single brush on the other end of the Finish Line Grunge Brush is perfect for cleaning your cassette (even when installed on your rear wheel). But I also use it to clean the inner chainring on my crankset, by simply spraying some drive train cleaner on the brush-tip, put the Finish Line Grunge Brush against the chain ring and give your cranks a spin. However it is a multi purpose brush-end that can be used for many cleaning activities. 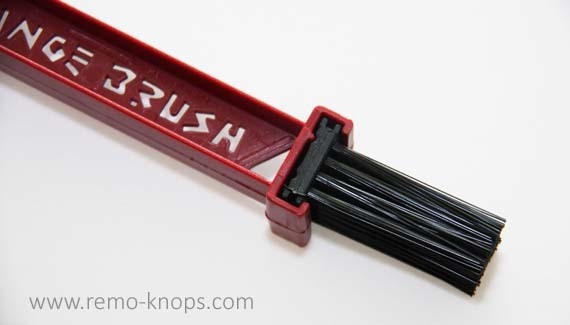 The Finish Line Grunge Brush is a must-have cleaning accessory for your bike. The price point of Finish Line Grunge Brush is around € 11,– while a brush replacement kit will cost you about € 6,–. The only comment that I could make is that ergonomics of the handgrip could have been better, however the brush is perfectly functional and it is not an accessory that you will use hours in one go. A new version of the Finish Line Grunge Brush has indeed improved ergonomics. The Finish Line Grunge Brush is well designed, robust and the brush replacement kit makes it a long-term investment. Hey!, I found this information for you: "Finish Line Grunge Brush review". 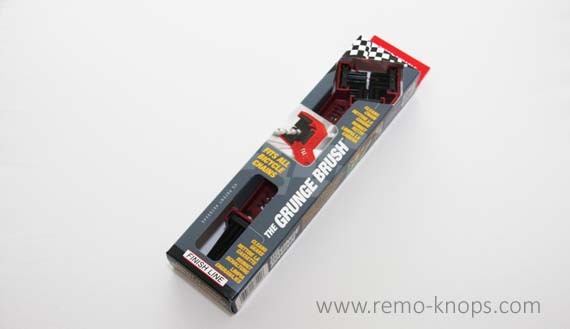 Here is the website link: https://www.remo-knops.com/6445/finish-line-grunge-brush-review/. Thank you.